“I called your office this morning in search for any product to help remove rust marks from my patio porcelain tiles. Gary kindly recommended that I try Net-Trol and he said it usually works though the product is for wood cleaning. He asked me to order a sample pot but as I couldn’t wait, I managed to find it at Brewers some 10 miles away! I have used it and wow, I was impressed and amazed!!! 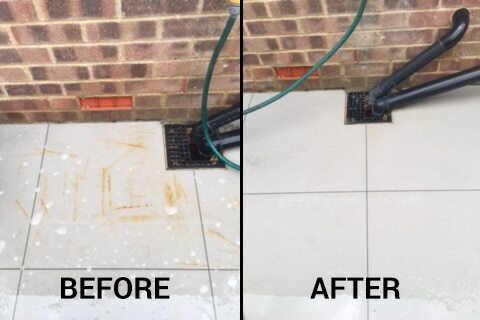 Within ten minutes and very little scrubbing with a toothbrush my tiles are cleared of the rust marks. 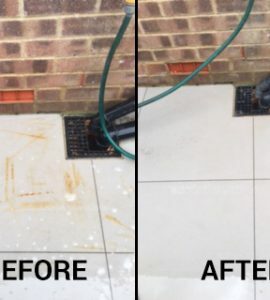 Net-Trol is a fast acting wood cleaner and color restorer, but as you can see here, it also works wonders on cleaning unsightly rust stains from porcelain tiles. We are very happy to have yet another satisfied customer. If you have a project but are unsure of what you should use, feel free to contact us and we can discuss the best products for you.